"Mom, I love you. But this is not your Mother's Day card. I know you read my blog - thank goodness because at least I know someone does! - so I would not be so foolish as to post your card here before YOU could open it. This is the card I made for Mark to give his Mom. Rest assured that I have one created with YOU in mind, but I'm not gonna spoil the surprise. You'll just have to wait until Sunday!" Thanks stampers for letting me say that. My Mom is so supportive - she reads my blog everytime I post and in true Mom fashion, loves everything I make and comments on Facebook for just about all of them too. I just didn't want to get her all excited that this was "her" card, know what I mean? I'll post hers on Monday - promise! Actually, I think Mark's Mom reads my blog too, but she probably won't get around to it today or tomorrow, so I think I'm safe. I got a few Sneak Peek products in over the past week (three separate orders to be exact, but who's counting?) HA! This card is showing off the gorgeous NEW In Color - Raspberry Ripple. LOVE it! It's so deep and rich, really perfect for so many different projects, but here I decided to go vintage. 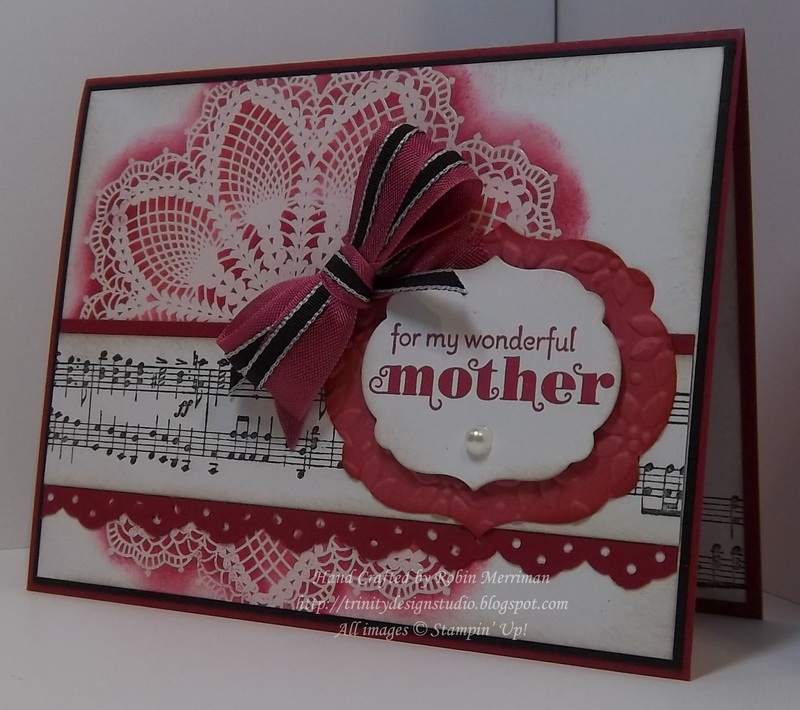 The card base is Raspberry Ripple cardstock and I layered it with Basic Black and Very Vanilla. The Very Vanilla layer was stamped with Hello, Doily in Versamark and Heat Embossed with Clear Embossing Powder. Then I used one of my very favorite WOW techniques - Emboss Resist - and rubbed a combination of Raspberry Ripple and Primrose Petals ink all over the image. The Primrose Petals (another NEW In color) is rubbed between the inside of the doily image and the outer edges. Those were rubbed with Raspberry Ripple. It's hard to see the two tone effect in my photos (stupid camera!) but it's really lovely in real life. Once that was done, I sponged the edges with a bit of Crumb Cake ink. The next layer is a strip of Raspberry Ripple cardstock punched along the bottom edge with the Eyelet Lace Border Punch. I layered it with a piece of Very Vanilla that I stamped with the Music Standard Wheel in Basic Black. It's also edged in Crumb Cake. The greeting layers were done with a piece of Raspberry Ripple cardstock cut out with the Labels Framelits then embossed with the Petals a Plenty Embossing Folder. I sponged a bit of Raspberry Ripple ink on the edges and layered it with a piece of Very Vanilla that I cut out with the next size down. I'd stamped my greeting from Delightful Dozen first in Raspberry Ripple ink and simply cut around it with my Framelit. Like a punch for the Big Shot - so cool! It's sponged with some Crumb Cake ink and adhered with Stampin' Dimensionals. I added a Large Pearl (carrying over from the Occasions Mini Catalog!) to the label and then made my double bow as a final accent. The Rose Red Seam Binding Ribbon is a perfect tone to use with these two In Colors - a sweet discovery! I paired it with some 1/8" Taffeta in Basic Black and adhered the bow with Mini Glue Dots. I really hope she likes the card. She's very musical and has sang in church and in a gospel group for years so it seemed appropriate for her. So, I bet you can't wait to get your hands on those New In Colors now, eh? I've got more samples to show you, but next week is my daily farewell showcase to the retiring In Colors. Be sure to check in each day and get ideas for how to use those still gorgeous colors! Place your order for Stampin' Up! 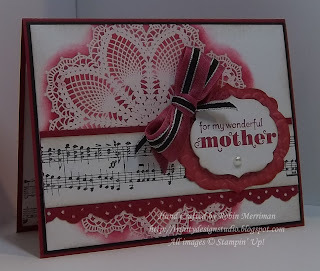 supplies Online in my store: Robin's Online Stampin' Store. Ooooh! Robin, this is SO pretty! Great job! Love,love,love thia card. Can't wait to get my order. That doily stamp is one of my favorites.